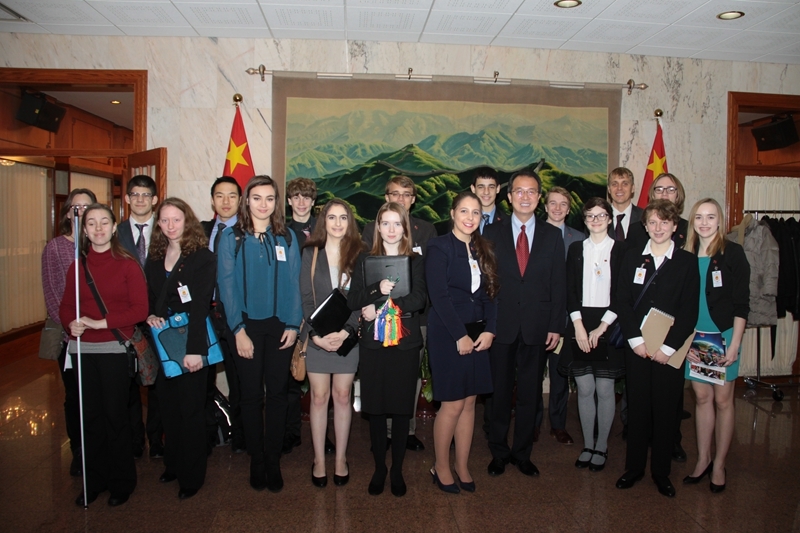 On December 9 Consul General Hong Lei gave a lecture on China and the United Nations at the Consulate General to 18 teachers and students from Monona Grove High School in Wisconsin, who came to Chicago for the 2016 Chicago International Model United Nations. 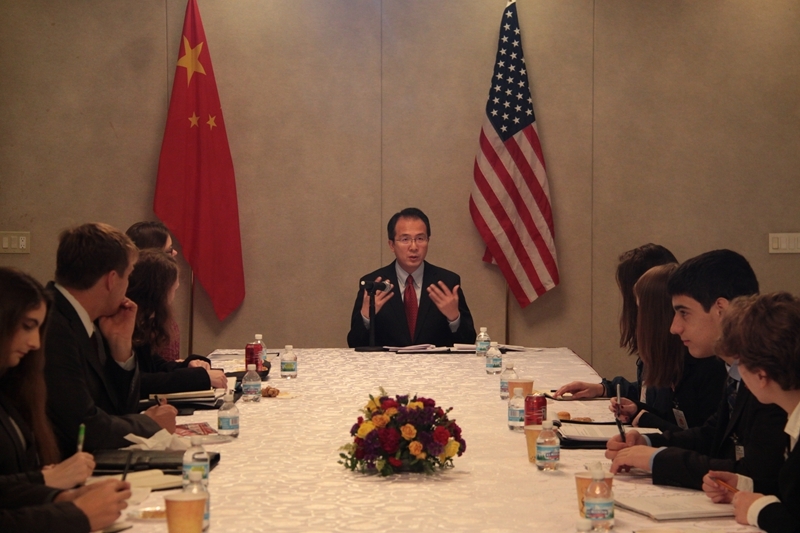 CG Hong Lei briefed the group on China's foreign policy and cooperation with the United Nations. He said that China stays committed to the independent foreign policy of peace and will never seek hegemony, expansion or spheres of influence. China has established partnership relations with more than 80 countries and organizations, resolved boundary issues with 12 neighbors along the border through negotiations. China has applied Chinese wisdom to the solutions to such regional and hot issues as the Iranian nuclear development, Syria, South Sudan, the Middle East peace process and the Afghanistan. CG Hong Lei said that China upholds principle of common development, shares its growth opportunities with the rest of the world and engages in mutually-beneficial and win-win cooperation. China has vigorously promoted the Belt and Road Initiative, worked hand in hand with others to manage the Asian Infrastructure Investment Bank, successfully hosted the G20 Hangzhou Summit and made important contribution to the conclusion and implementation of the Paris Agreement on climate change. CG Hong Lei said that China supports the United Nations in playing a central role in international affairs and has been firmly committed to the international order and system with the purposes and principle of the UN Charter at its core and staunchly upheld international rule of law. China takes up the biggest share of UN membership fees and largest contributor to peacekeeping funding among developing countries. China has taken the lead among UN member states in achieving the Millennium Development Goals and lifted more people out of poverty than any other country. China has also been the largest contributor of UN peacekeepers among the five permanent members of the Security Council. CG Hong Lei said that this year marks the 45th anniversary of the restoration of the lawful rights of the People's Republic of China in the United Nations. The past 45 years witnessed enormous progress for the cause of the United Nations and for China-UN cooperation. The more prominent global challenges are, the greater the need for the UN to advance with the times. The role of the UN can only be strengthened, not weakened. China hopes and believes that the UN will fulfill its responsibilities imparted by the UN Charter and play a more positive and constructive role in promoting international peace and development, strengthening and improving global governance and other aspects. During Q&A session, CG Hong Lei also answered the students' questions regarding China's economic development concepts, poverty alleviation policy, health care reform and trade and investment policy. Monona Grove High School will play the role of China in the 2016 Chicago International Model United Nations. The students thanked Consul General Hong Lei for the lecture and said that lecture was rich in content and helpful for them to better understand China's foreign policy and national conditions. 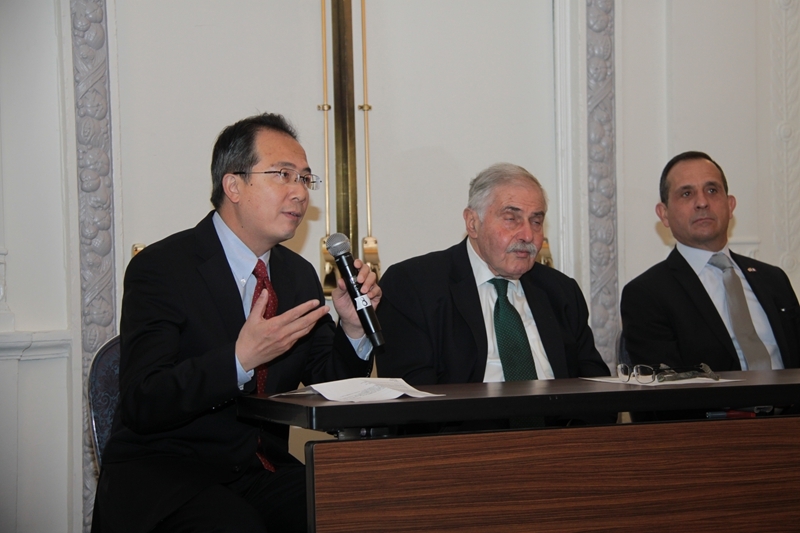 After the lecture, CG Hong Lei attended a Model United Nations program at Hilton Chicago, where he and Consul Generals of France, Indonesia, Turkey, Sweden, New Zealand and other countries exchanged views with the participating students.